The Schnauzer was bred in Germany, this breed is the largest breed in three Schnauzer breeds. This breed of dogs is used to guard sheep and cattle they are known for their good guarding abilities, this breed is not easy to find in United States.the schnazer breed of dogs is powerful and a large breed, this breed is hard tough and bold, they can resist in any weather and are very protective. This breed is very loyal to their masters and family they are determined and very alert. This breed of dogs possess high intelligence and are very loyal and protective they are very sensitive, they do not do well if they left alone for some time. They are not good with no vice owner they require dominant owner who can drive them high. They are good with children over the age of 14 and do well in homes they are also work as a watchdog, the schnauzer typically not good with other house hold pets but can get with them if they are given proper obedience training. This breed has double coat the outer coat is wiry thick and harsh while the under coat is dense and soft. The color of the coat is either salt and pepper or pure black, This breed sheds little to no hair. they require early obedience and socialization they are dominant breed and require the dominant handler they require consistent training they will not respond to any hard and harsh methods of training so training should be given to them with fairness and patience. 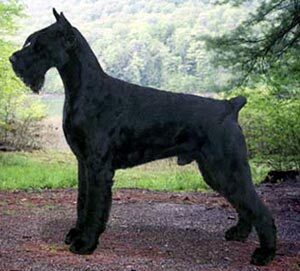 The Schnauzer, Giant is prone to the following dog diseases and health problems. It is important for dog owners to protect their dogs from these diseases and if you see any sign or symptoms of disease consult with veterinary.